Are Birthmarks Connected To Your Past Life? 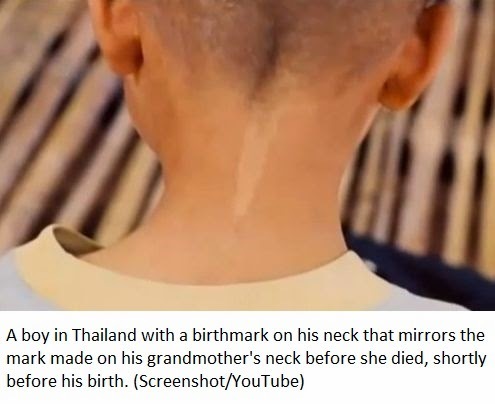 An old woman died in Thailand with the wish to reincarnate as a boy. Her daughter dipped a finger in white paste and marked the back of the woman's neck with the paste. 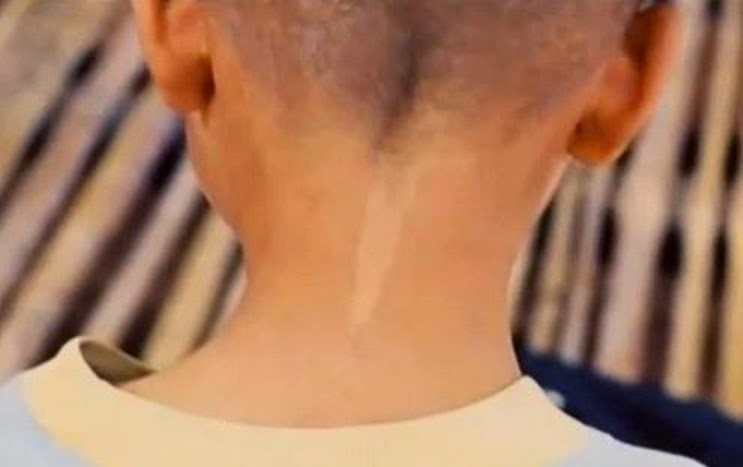 Not long after the woman's death, the daughter gave birth to a son with a white mark on the back of his neck that mirrored the white paste left on the woman's neck. When the boy became old enough to talk, he would claim possession of things that belonged to his grandmother as though they'd always been his. 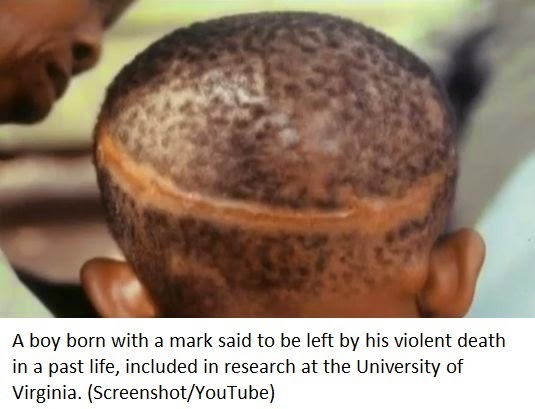 This is one of many cases recounted by Dr. Jim Tucker at the University of Virginia in which birthmarks seem to relate to past lives. The late Dr. Ian Stevenson, whose work Tucker continues, investigated 210 cases of children with birthmarks or defects that related to memories they retained from past lives. Stevenson obtained a post-mortem report in 49 cases. The wound and birthmark were within 10 square centimeters of each other on the body in 43 percent of these cases, and many were much closer to the same location. In some cultures, people mark the deceased with soot or paste to recognize them when they are reborn. Here are a few examples of birthmarks related to past life memories studied by Stevenson. A boy born in India without fingers on his right hand remembered another life in which he was a boy who had his fingers amputated after sticking them in a fodder chopping machine. A boy in Turkey with a malformed right ear remembered having been shot and killed at close range on that side of his head. A boy named Maha Ram in India could remember being killed in a previous life with a shotgun fired at close range. He remembered enough details of his past life for Stevenson to find the autopsy report of the man supposedly reincarnated as Ram. The birthmarks on Ram's chest corresponded to the bullet wounds. Some anecdotal accounts of birthmarks from past lives that have not been verified are shared on a past life discussion blog post. Karen Kubicko posted photos of herself in high school with a birthmark on her neck and a photo of herself later in life without the birthmark. She said she remembered in 2011 that in a previous life she was a woman named Helen who was hit by a stray bullet in the neck and died in 1927. The mark was where the bullet had hit in her vision. After she remembered this, the mark gradually disappeared. Another person on the blog said she had a birthmark on the back of her leg. She remembered a past life in which a snake bit her there. A few years later, she realized the mark had faded away. She said the area is not often exposed, so light exposure or other such external elements are not to blame. Read more on the evidence for reincarnation here.